In metaphoric expression, there is an ordinary word that could have been used but isn’t, and in its stead, another word is used—a word with remote connotation—that drives the expression in an unexpected twist. Metaphor is a figure of speechOpens in new window which by its expression or suggestion, exclusively consists in the resemblanceOpens in new window of two objects by applying either the name, or some attributeOpens in new window, adjunctOpens in new window, or actionOpens in new window, of the one, directly to the other. 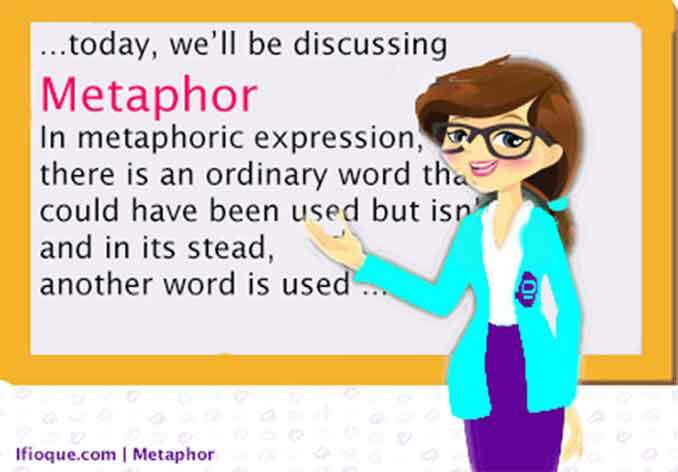 Generally, metaphors take two different objects, and equates them as the same, by stating that the first object is the second object. Her voice is music to his ears. My brother was boiling mad. It is going to be clear skies from now on. EtymologicallyOpens in new window, metaphor is derived from the Latin etymon “metaphora”, translated as: a carrying over; literally meant to move a word from one place to another. Metaphors allow rhetorsOpens in new window to move beyond the limitations of languageOpens in new window because their meaning is not literalOpens in new window but is informed by contextOpens in new window. Based in the definitionOpens in new window offered by the rhetor, I. A. RichardsOpens in new window, metaphor is “a shift, a carrying over of a word from its normal use to a new use.” This definition supposes that there is an ordinary word that could have been used but isn’t, and in its stead, another word is used — a word with remote connotation — that drives the expression in an unexpected twist. Here, two terms are used to name the original or expected word, and the unexpected one, which Richards calls the tenor, and the vehicleOpens in new window. The tenor —which is the original or expected word— is the subject to which attributes, adjuncts, or actions are ascribed. The vehicle —that which represent the unexpected word— is the object whose attributes, adjuncts, or actions are borrowed. “The first line is literal, the second metaphorical: the whole metaphor begins with some such unspoken word as “brushed,” which would be the tenor. Then the vehicle begins with “fiddled.” The point of the metaphor is to bring different associations, more dramatic connotations, into the reader’s mind. The resemblance between a woman combing her hair and a violinist with long black hair playing a pianissimo passage is remote — a brush is not much like a bow — but the visual relation is sufficiently active to hold the two images together. If the lines make us imagine for the moment a different world than our own, all the better. The force of a good metaphor is to give something a different life, a new life. 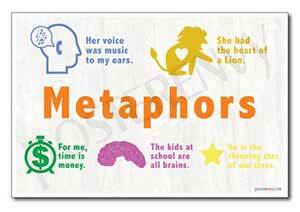 The function of metaphor in literary works is usually to address one object or situation while alluding another. It is used as a figure of speech and as a form of analogy. Famous examples of the metaphor in poetry include “Cut” by Sylvia Plath, “The Road Not Taken” by Robert Frost and “The Country of the Blind” by C.S. Lewis. In Ancient Greece, Aristotle believed there were only four types of metaphor. Of these four, only analogy is still considered an element of metaphor. The other three are now considered to be elements of metonymy and synecdoche. Regardless of the other three, Aristotle believed that analogy was the most important of all.